Enchanting Annabelle | Faddegon's Nursery, Inc. Imagine new shoots in spring emerging upward, yielding enormous creamy white flowers in July. 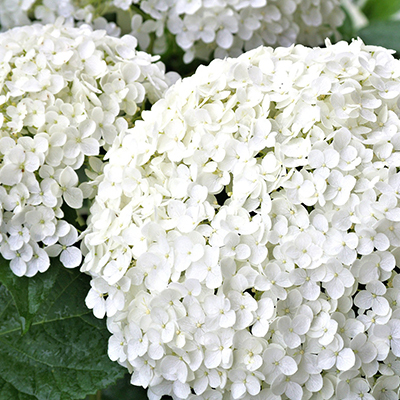 This is Hydrangea arborescens ‘Annabelle’. She is the best known of the arborescens and very much loved by gardeners North and South. First noticed in a woodland setting in Anna, Illinois in 1910, ‘Annabelle’ soon became one of the darlings of the gardening world. ‘Annabelle’s’ common name is “Hills of Snow” for the abundant flowerheads each growing to 10-12” in diameter on a medium sized shrub. Enjoying partial shade (but tolerating full sun with enough moisture) Annabelle blooms forth at a time when many other flowering shrubs are beginning to slow. Perfectly at home in a cottage garden bed, ‘Annabelle’ is also a wonderful choice as a hedge since she can be cut back in winter keeping things neat. ‘Annabelle’ grows on new wood coming up from the base of the plant each year. Reliability is another distinguishing feature of this beautiful hydrangea. Sub-zero winters and enthusiastic pruning won’t get in the way of flower production. ‘Annabelle’ blooms every year, without fail, and just as profusely as any other year. Many gardeners prune her down to the ground late in the winter, so you see; it would be difficult to prune this girl too much! ‘Annabelle’ is easy to care for, native to the U.S. and one of the most beautiful plants you’ll bring to your landscape. It’s no wonder she has so many fans!